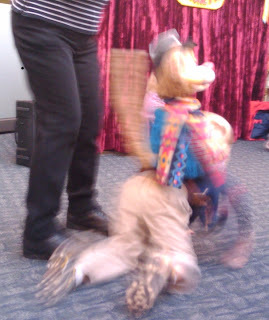 If you live locally and ever get a chance to see Puppets Please Marionettes, take it. This is a fun little show that your preschoolers will love and elementary kids will enjoy. We've been to several of their shows at various branches of the Tacoma Library system. Today, we got to enjoy them at the Olympia Library. 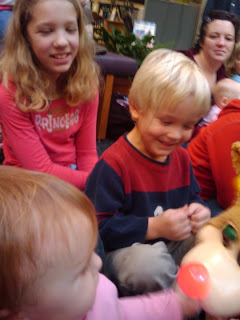 Josh LOVED the interactive show. 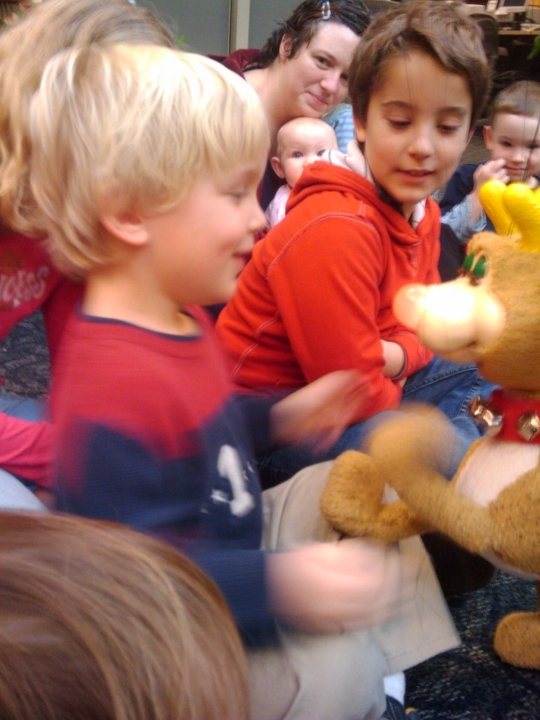 Here's Rudolf saying hello. 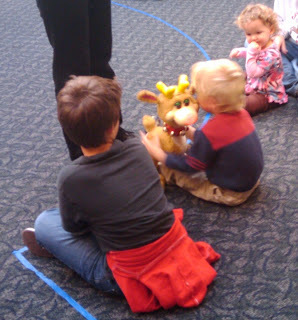 Maddie got to say hello to Rudolf, too. Can you tell that Josh is loving the show? Look at that smile. Mika has her grown-up-and-enjoying-the-little-kids-enjoying-the-show smile on. 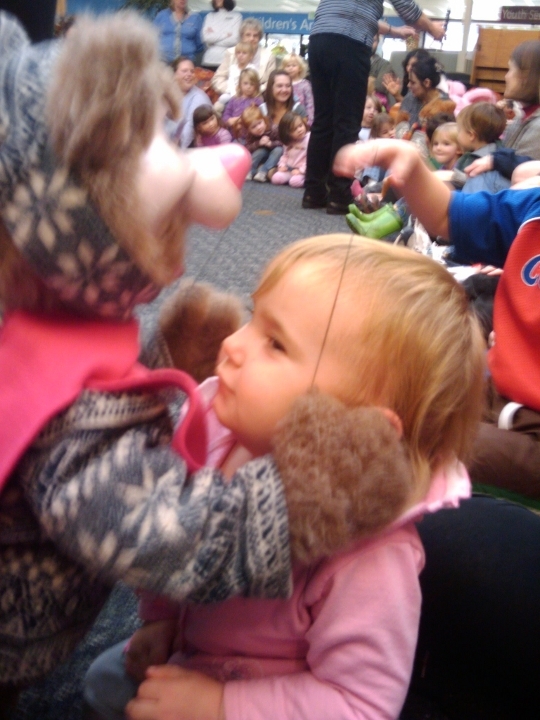 Maddie got a nice big bear hug from this puppet. Every kid who wanted a hug got one, actually. Maddie didn't really know what to think. She was a little bit concerned, a little bit interested, a little bit disinterested, and a little bit tired and needing her nap. After the show, we headed over to check out the children's section. 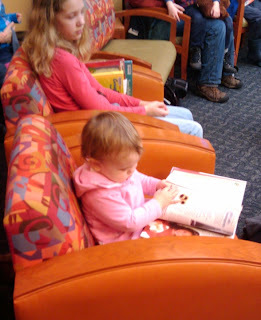 It was our first visit to this library so we wanted to check it out, and Josh wanted Curious George books. Josh and Maddie played with toys they had available while the rest of us looked through the stacks and kept an eye on them. Then, because we were still there and there was room, we decided to watch round two of the puppet show. Josh was all for it, anyway. He got to see Rudolf again. Santa came to visit. 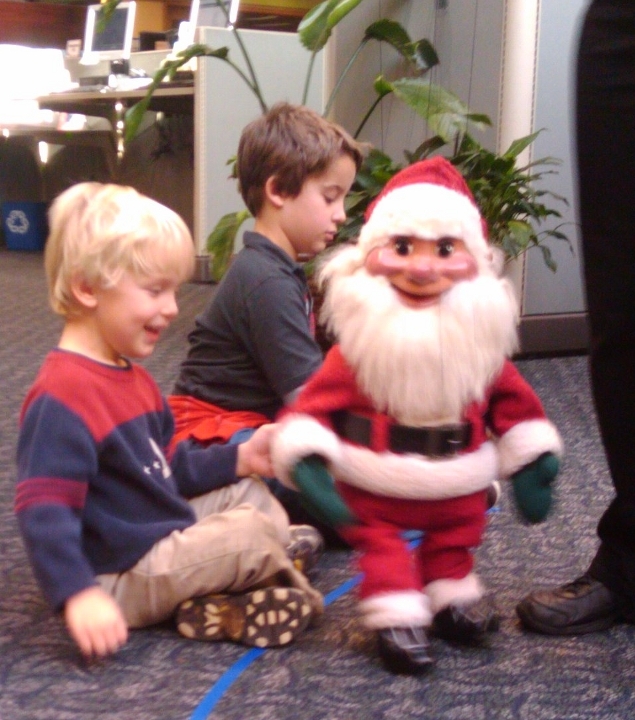 Josh was a little surprised that Santa was so small. I think he thought this Santa was the real Santa, and he thinks Santa is real with no help from me in forming that idea. He also gave this cowboy one wild horsey ride. Was Madelynn interested in show number 2? Nah, she'd rather read a book. During the section show, I got to talking with another mom who happened to be a homeschooler. She has a son about two years older than Sam who likes math, likes Lego, and likes Doctor Who. Pretty good combination for a possible new friend. They told us about an impromptu park day so we stopped by the park and met a couple of other homeschool families, as well. Yesterday, the big kids and I had gone to the Lacey Library where we also met a new homeschool family with kids similar in age. Maybe we will find some local friends.